Sources told TSN Sunday that Liles and the Colorado Avalanche have agreed to terms on a four-year contract worth an average of slightly more than $4 million per year. Liles was scheduled to become an unrestricted free agent on Tuesday. The deal was formally announced Monday. As expected, the Avalanche also announced that they have re-signed Foote. Sources told TSN Foote's deal is believed to be for two years and a total of $6 million, or $3 million per year. I'm thrilled that we finally have a bit of news to chew on. While I value guys like Brunette and Finger much more, bringing back Liles isn't a bad move, just a questionable one. To give a guy four million dollars when his production has been falling is a little peculiar; although, he did play better after the trade deadline last season. He'll be making roughly the same amount as Jay McKee and Adrian Aucoin next season. Putting it in perspective, it may turn out to be ok.
Adam Foote apparently was offered 3.5 million per yeah and decided to sign for 3. This is simply a rumor floating around on the message boards, but if it's true, Footer did the Avalanche a great service. His physical presence is going to be key for this team. Free Agency starts at 1 PM EST tomorrow. Here's the updated list of who Colorado is worrying about. After watching Brett Favre spend countless offseasons take forever in deciding as to whether or not he should retire, I prayed it would never to come to that with Joe Sakic. While Sakic has been signing one-year deals for several seasons now, the possibility that he was going to retire was never imminent. He has said numerous times that he would like to play in the 2010 Oylmpics and after a 100-point 06-07 season, there were no signs of him slowing down. All that changed last year when Joe missed 38 games (a career high) with a hernia injury. Suddenly, on a team that doesn't seem to be a Stanley Cup favorite, Sakic, who will be turning 39 on July 7th, now needs to decide whether or not he wants to help bring about a youth movement for Colorado or if it's time he hangs up his skates and lets Paul Stastny take over the #1 center spot. However, Sakic will not make this decision by July 1st, the start of free agency. Joe Sakic has further extended the time he needs to decide whether to return to the Avalanche — and it could hamper the team's free-agency spending plans. Sakic "definitely will not decide by July 1," Avalanche vice president Jean Martineau said Monday night. That is the date when NHL players can become free agents. The Avalanche is maintaining public support for Sakic, but his indecision could hamstring the team and take it out as a possible player in the free-agent market. As the article points out, it's going to be tough for the Avs to address most of their needs without knowing whether or not they will need an extra 6 million to sign Sakic. According to a lack of sources, Andrew Brunette isn't being talked to by Francois Giguere while Marek Svatos and Wojtek Wolski still haven't sign qualifying offers. Jose Theodore is entering free agency on July 1st and the same might be true for John-Michael Liles, Jeff Finger, Adam Foote, and Kurt Sauer. This team could and probably will be left with considerable holes to fill. Knowing how free agency works in the NHL, you'll see the good ones scooped up in just a few hours on the first day. If the Avs can't sign a top foward to help possibly replace Brunette or a good stay-at-home defenseman to replace Finger or Foote, then there will be serious trouble next season. That being said, no one in the game has earned the right to time more than Joe Sakic. What he has done for this franchise is unmatched by any active player. However, if he is interested in making sure the Avalanche remain competitive for years to come, he'll make his decision by July 1st and save Giguere the many sleepless nights. The Denver Post reports that Jose Theodore will test the free agent market on July 1, as contract talks between the Avalanche and and the veteran goaltender have broken down. "I would say we are going to July 1," Theodore's agent, Don Meehan told the paper. "There's a chance we could still negotiate with (the Avalanche) after that, but right now it's looking like we're going to July 1." After reports that Theodore wanted to stay in Colorado, I felt that an affordable contract would be figured out and the Avs wouldn't have to worry about goaltending this offseason. Instead, that's exactly what they have to worry about. Without Theodore, Peter Budaj becomes the automatic starter. That may not be a bad thing, as this is a contract season. (We all saw how Theo played in his contract season.) However, a Budaj-Weinman tandem isn't going to give me the utmost confidence that this team can win the Stanley Cup. There aren't many goalies hanging around in the free agent market right now. Christobel Huet is likely to be signed by the Capitals while Ray Emery, Andrew Raycroft, and Olaf Kolzig are either past their primes or have to much baggage for the Avs to take on. While a trade is always possible, and certainly, it will still be possible for the Avs and Theodore to reach an agreement after July 1st, I have the feeling that Giguere is going to let it slide and allow Peter Budaj to be the starter. Can Peter Budaj lead this team to the Stanley Cup? If there is any doubt in his mind, then he has a lot of work to do. With so many key players potentially leaving this offseason, these were not the moves Avs fans were hoping for. The Colorado Avalanche have signed forward Scott Parker to a one-year contract through the 2008-09 season. "Scott Parker has been part of our team for many years," said Avalanche Executive Vice President & General Manager Francois Giguere. "We're pleased to announce that he has decided to remain with our organization." While the Avs were an astounding 25-6-4 with Parker in the starting lineup (since he was re-acquired), he isn't named Brunette, Svatos, Wolski, Sakic, Finger, or Liles so Avalanche fans are going to be disgruntled that this is the first bit of news. I don't understand giving any money to a guy who really can't score (He has just 21 points in 308 games) and whose fighting skills could be replaced by the skills of Cody McLeod or Cody McCormick. The Avalanche also announced that they've acquired forward Matt Hendricks from the Boston Bruins in exchange for defenceman Johnny Boychuk. I figured the Avs weren't going to sign Boychuk so at least they got something for him. According to the article on TSN, Hendricks spent all of last season in the AHL and that's the role he is likely to play on the Avalanche. By now, my thoughts about the UFA's have already been made public, but now it's on to the RFA's. Last season, Kevin Lowe shocked the hockey world by offering huge contracts to Thomas Vanek and Dustin Penner. Offering these kind of contracts to RFA's does one of two things. It either forces the team to sign the player for much more than they planned; therefore, it could have an adverse affect in the future. Or, it steals the player away from his current team in exchange for what usually amounts to draft picks. The Avs are unlikely to have any of their players get hit with big offer sheets. They all have some kind of baggage attached to them which will likely scare some team away. Lets just be blunt and say it is time to get rid of Johnny Boychuk. This kid has been in Colorado's system since he was drafted in the second round of the 2002 Entry Draft. He's only played four games for the Avalanche - all of them came last year, as a foward. His stats at the AHL level haven't really signed and it's time that the Avs start focusing on their other defensive prospets. (They drafted two more players on Saturday and have a system featuring several promising players). All of Wolski, Svatos, McCormick, and McLeod should and probably will be signed by the Avalanche. Wolski and Svatos represent two of the best youngest players on the Avalanche and will only grow from this point foward. Svatos, of course, has run into injury troubles, but he was effective last season. McCormick and McLeod both played well as energy players last season and add some size and grit to a what is really a very small group of players. Both really be affordable and probably sign for under 1 million. That leaves Tyler Weinman, who I believe will be retained by the Avalanche and eventually be the backup once Peter Budaj is traded before the start of the season. The market is very shallow for goalies this year and Budaj will bring in a decent return. After all of these UFA's and RFA's are signed, the Avalanche are still going to have some room to sign a player or two in free agency. I'll try to dig up some rumors that are spreading this week and analyze whether or not they make sense. Until then, look out for what could be a new layout to The Avslova Factor. More graphics, more pictures, more links, and the same loading times. After yesterday's draft, it's hard to imagine any of those players that the Avs picked making an immediate impact next year. Gaunce and Tessier may have the best shots, but even those players are somewhat of a mystery at this point. With that being said, lets take a look at the players Colorado will have to deal with in free agency this year. This post will only deal with players scheduled for Unrestricted Free Agency. Joe Sakic should be the first name that jumps out at you. He has already said that he will either sign with the Avs (another one year deal) or retire. If he chooses to not come back, that will free up some cap room and will allow the Avs to either go out and sign another free agent or sign somebody they were originally going to have to let go. Jose Theodore has also publicly said that he wants to stay in Colorado. Theodore's agent said Wednesday he expects to talk with Avalanche general manager Francois Giguere soon about a new contract for the 31-year- old goalie, who can become an unrestricted free agent July 1. "We're looking forward to seeing Francois and having discussions with him," agent Don Meehan said. "Jose's priority would be to be back in Denver. We've expressed that to Francois, and they've indicated they would like to have him back." Theodore played well for the Avs last season and if he wants to come back and is willing to take much less than he was making when he came to Colorado, then he will be retained. The most interesting problem is what we do with our defenseman. Adam Foote, Jeff Finger, Kurt Sauer, and John-Michael Liles are all UFA's come July 1st. Liles played well last season but has been in a decline offensively for the last three seasons. His totals have gone from 49 t0 42 and have bottomed out at 32 this past season. As a quarterback on the power play, I've never believed Liles was particularly effective and about to turn 28, he hasn't made significant steps throughout his career. A fan favorite, I believe looking to trade the rights to Liles wouldn't be a bad idea, and then trying to land someone like Wade Redden, who could do the job just as well. Sauer is also an interesting case. At one point, he was our best defenseman last season. However, he is wildly inconsistent and is somebody else I think should be let go. As you may have guessed, it's my opinion that Colorado should work hard to keep Adam Foote and Jeff Finger. Finger is young (and affordable) and isn't afraid to use his body. Foote cost us a first round draft pick and losing him would be the equivalent to Pittsburgh possibly losing Marian Hossa. With those signings, the defense would consist of Foote, Clark, Finger, Hannan, Salei, and Leopold with Cumiskey waiting in the wings. Don't forget, by not signing Sauer and Liles, the Avs would be able to go out into the market and sign another defenseman to add depth. On the offensive end, Peter Forsberg is said to be meeting with his doctors and will make a decision as to whether or not he is fit to play. After league meetings in Detroit two weeks ago, Giguere said Forsberg was visiting a doctor in Sweden to determine if he can physically handle another season. "I think his will to want to play is there," Giguere said. "Now there's a question medically - does he think that he's capable of playing a full season?" With the bad feedback I'll receive in mind, I have to say that it's time for Forsberg to retire. Wehther it's been the ankle or the groin or the visa, the troubles surrounding this guy are too great to take on for a full 82 game season plus the playoffs. He needs to go out now while he still has some dignity. Someone who does need to come back is Andrew Brunette. There have been no reports of contract talks and Giguere would be a fool to let him go. He played in all 82 games last season and was the team's second leading scorer in both the playoffs and the regular season. Less importantly, Scott Parker and Wyatt Smith are all but irrelevant. Parker's time in Colorado is done if the rumors about Per Ledin are true and Wyatt Smith will only be signed to fill out the team in Lake Erie. Whatever the Avs decide to do, they will be active when trying to sign players in the Free Agent market. While not looking at somebody like a Marian Hossa or a Brian Campbell, somebody like Mark Streit would be a good fit for this team. In my next post, we'll take a look at the restricted free agents and at top free agents league wide. Round one of the 2008 Entry Draft will air tonight at 7 PM on Versus. Rounds two through seven can be soon on Saturday morning at 9:30 AM on the NHL Network. The Avalanche traded their first round pick to Columbus as part of the Adam Foote deal so barring a trade, the Avs will not make their first selection until Saturday. This draft has been labeled as "very deep" by most experts, so there is no reason to think that the Avs shouldn't get a good player in Round 2. However, it would be foolish to think that Francois Giguere won't try to trade up to either move into Round 1 or get another pick in Round 2. Will the Avs get one of those players at 50? Probably not. The question then becomes, what do the Avs need? While nothing has been confirmed, I'd be shocked if Jose Theodore were not in an Avalanche jersey next year. The question then becomes, what becomes of Peter Budaj? Avalanche management have stated that they wouldn't mind Tyler Weinman becoming the backup next season, implying that trading Budaj might be in the cards. Anyone paying attention to Colorado's system knows that it lacks the high-end defensive players that other teams have assembled. The top players include 2007 first round pick Kevin Shattenkirk, Kyle Cumiskey, Johnny Boychuk, Kevin Montgomery, Nigel Williams, and Colby Cohen. The Avalanche have always been good at drafting offensively skilled players. Currently in the system are TJ Hensick, Ryan Stoa, Codey Burki, T.J. Galiardi, Justin Mercier, Chris Stewart, David Jones, Denis Parshin, and Paul Carey. It may be a strength for the Avalanche, but there are some players in this draft who could benefit the club in the future if the majority of the players listed above don't work out. To be frank, I highly doubt the Avs would take a European foward with a high draft pick. First of all, you can completely eliminate any Russian. Thanks to the lack of a transfer agreement, many teams are weary of picking Russians only to never see them in North America. This was the case last season when highly touted Alexei Cherepanov fell all the way to the Rangers at 19. That last name you see is indeed part of the famous Staal clan. His brothers, Eric, Jordan, and Marc are already established NHL'ers but this one is a little bit different. He is said to be the most talented of the bunch but also the laziest. If the Avs aren't looking for any immediate help, they should consider taking Staal if he's still around at 50 just on the name alone. I'd be shocked if Giguere doesn't make a trade at some point over the next two days. There has to be someone they like enough who is worth moving up for. I think they may be looking to take a foward, as several of the team's veterans still have not re-signed (they include Brunette and Sakic). A goaltender is certainly a possiblity. They did take Trevor Cann last year and have another kid named Billy Sauer who has a chance of making it, but Tyler Weinman isn't a sure thing and if Peter Budaj does end up getting traded, depth will be an issue. It should be an interesting night. Lets just hope it all works out. As is everything in this blog, these awards are strictly my opinion. If you take issue, please let me know. I may actually think your opinion over for a minute. I believe that these three stars are an accurate representation of the 2008 Avalanche roster. These three players were keys to the Avalanche making the playoffs and advancing past the first round. Congratulations to them. Make sure to watch the draft tonight and visit us tomorrow for first round analysis and some trade rumors from around the NHL! One night before the first round of the 2008 NHL Entry Draft, The Avslova Factor has returned. In the month (and then some) of time we've missed, there has been a blurry of activity concerning the Avalanche. This post will cover everything that we have missed. The Colorado Avalanche Hockey Club announced today that Joel Quenneville will not return to coach the team next season. Colorado Avalanche Executive Vice President & General Manager Francois Giguere announced today the appointment of Tony Granato as the franchise’s head coach. Granato previously served as the team’s head coach from 2002-2004. You have to wonder what Francois Giguere is thinking with this move. 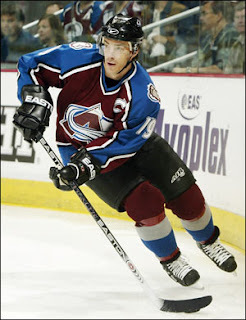 While Granato has the best winning percentage out of any coach in Avalanche history, he was handed a team consisting of names like Sakic, Forsberg, Hejduk, Tanguay, Kariya, Blake, Selanne, and Foote, yet he failed to go anywhere in the playoffs. Going even further, he was responsible for the dreadful power play this season, something which could have caused him to get fired, not hired. There were better candidates out there, including Pat Burns, Pat Quinn, and former Sharks coach Ron Wilson. Giguere could have waited a few more weeks and he would have had the chance to hire former Lightning coach John Tortorella. Rumors had been flying prior to the move that Patrick Roy could be in line for the job, but he stated that he wanted to keep coaching the Quebec Ramparts until his son was done. Because that could be as early as next year, it wouldn't be a stretch to think that Roy could be an assistant with either the Canadiens or the Avalanche in 2009. On the positive side, Granato is someone all of the players know well. After being demoted from head coach in 2004, TG stuck with team as an assistant coach and has developed a relationship with many of the veterans. The Czech scoring star will not be back in the NHL next season. Hlinka never really found his niche in the North American game, registering 8 goals and 20 assists in 63 games in his rookie year. He played just one game in the playoffs. All the best to him. The Colorado Avalanche Hockey Club announced today that it has signed defenseman Derek Peltier to an entry-level contract. 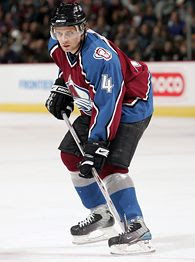 Colorado’s fifth selection (sixth round, 184th overall) in the 2004 Entry Draft, Peltier (pronounced Pell-TEER) played four seasons at the University of Minnesota (WCHA). He served as the Gophers’ captain in 2007-08, appearing in all 45 games. The Plymouth, Minn., native led the Gophers defense in scoring this past season with 21 points (4g/17a). Peltier sounds like a guy who will be filling out the minor league club this season. On a team that already features six or seven established NHL players and names like Cumiskey, Williams, and Boychuk already in late development stages, we probably won't be seeing Peltier on the ice this season. The Colorado Avalanche Hockey Club announced today that it has acquired forward Marty Sertich from the Dallas Stars organization in exchange for a conditional draft choice in the 2009 NHL Entry Draft. Sertich, 25, has spent the past two seasons with the Iowa Stars of the American Hockey League. He led Iowa in scoring during the 2007-08 season with 52 points (27g/25a) in 79 games. The 5-foot-9, 165-pound center also led the Stars in goals and power-play goals (9). Another small center in the Avalanche organization, I can't see Seritch fitting into the roster this season. If Sakic and Arnason come back, I highly doubt Sertich will play before Guite, Hensick, or Stastny. Once again, consider this a minor league signing. Reported on the Avs board with Swedish tabloids as a source, the Avalanche have apparently signed a Swedish energy player by the name of Per Ledin. However, the Avs have not confirmed the signing. It's been an interesting off-sesaon thus far. In my next post, we'll look ahead to tomorrow's draft, as well as hand out the 2007-2008 AF Awards.